I will be creating a database of all of the concerts I've attended. 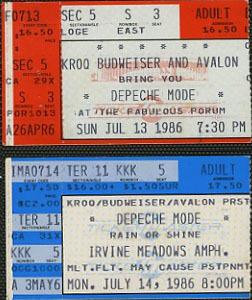 My first concert was Depeche Mode in July of 1986 at the Forum in Los Angeles. I will have a fully searchable database of all of the concerts. Echo and the Bunnymen, She Wants Revenge, The Cult, and more. I had a blast and got to watch some great bands and mingle with a few of them. I got backstage and all we could drink for FREE. I had a record I wanted to get signed by Echo & The Bunnymen but I left it in the car so I had to settle for getting my ticket signed. Check out the Bunnymen performing Lips Like Sugar at the show. Great show with a fabulous view from our room. Click here to check out a clip. Very cool small show but Trent needs to mix up his set lists a bit more. I guess it doesn't help that I've seen Nine Inch Nails six times in the past year. Great show! Standing in the PIT and I caught Martin's pick at the end of the show! Click on this link to see pics I took from the show. I got a 6th row center seat for face value for Depeche Mode. Great show. Below is a pic I took at the show. Depeche performed Macro instead of Damage People tonight. San Diego's audience was much better than LA surprisingly. What a weekend! 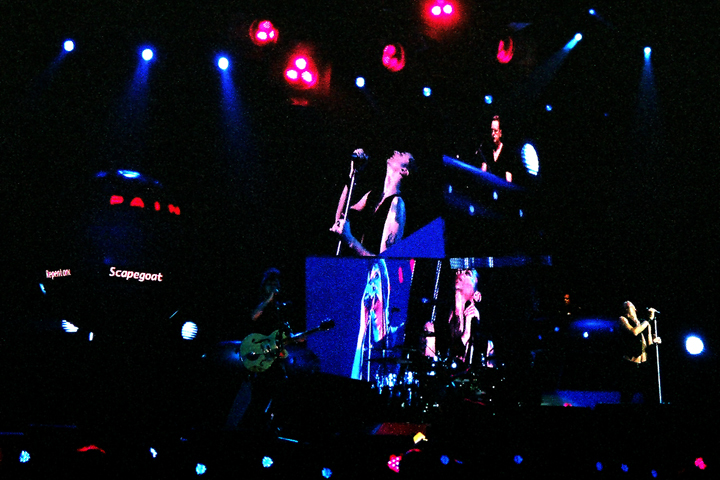 Depeche Mode at the San Diego Sports Arena on Saturday and Nine Inch Nails at Cox Arena on Sunday!